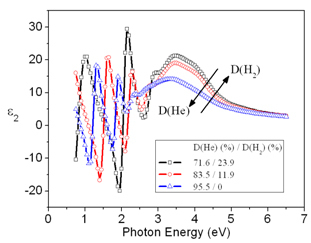 P-doped microcrystalline silicon films (µc-Si:H(p)) have been deposited by plasma-enhanced chemical vapour deposition (PECVD) using low RF power, from a silane and trimethylboron (SiH4/B(CH3)3) mixture diluted in helium (He) and hydrogen (H2). The material has been optically, electrically and structurally characterised. This work focuses on the effect of depletion regime on the properties of µc-Si:H(p). Four deposition parameters have been explored, all of them determining the amount of energy supplied per gas molecule, specifically the pressure (P), the total mass-flow (ΦT), the He- and H2-dilution – D(He) and D(H2) – and the applied radio-frequency power (RFP). The material developed here is intended to be used in the future as a BSF (back surface field) in silicon-heterojunction (SHJ) solar cells with a metal/TCO/a-Si:H(n)/c-Si(p)/µc-Si:H(p+)/metal configuration.